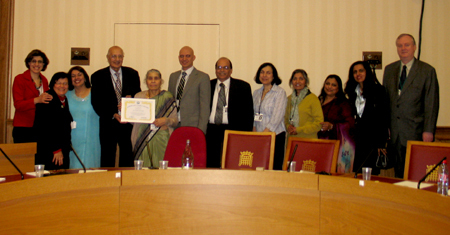 The UN International Day of the Family was commemorated in the UK's House of Lords on the 15th of May. Inspirational speakers Rioch Edwards-Brown and Iain Brown, founders of ‘So You Wanna Be in TV?’, Sheridan Mangal, CEO SFM Capital Markets Training Ltd spoke on ‘Repairing the Broken Family’ and Jack Corley, Chairman of UPF- UK, spoke of their passion for working with families, communities and young people. 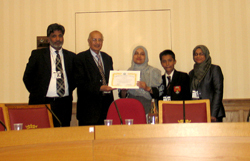 Family Awards were presented to three exemplary families including eight members of the Sharma family, Maria Andipa representing her family and Mr Shahid Ali with his wife, Mrs Fatema Nargis and son, Ome Shahid who were nominated by Stepney Green Maths, Computing & Science College for their commitment to the school as a family. UN Day of Family commemoration in the House of Lords on May 15th commenced with welcoming remarks from Lord King of West Bromwich. He began the session by talking about the difficulties of family life in modern day society. He praised the worth of some of the families in the room. Rioch Edwards-Brown and Ian Brown shared some of the trials they had had to overcome in their married life. These trials had made them closer and stronger as a result. The discussion that followed covered many topics including the role of schools in the raising of children, whether religion is useful or not in family life and gender equality issues and the family.